The informative and controversial findings in this book are based on two path-breaking national surveys of American families. Both show that while the family may be the central locus of love and support, it is also the locus of risk for those who are physically assaulted. The book provides a wealth of information on gender differences and similarities in violence, and on the effects of gender roles and inequality.Two landmark American studies of violence from the National Family Violence survey form the basis of this book. Both show that while the family may be the central locus of love and support, it is also the locus of risk for those who are being physically assaulted. This is particularly true for women and children, who are statistically more at risk of assault in their own homes than on the streets of any American city. 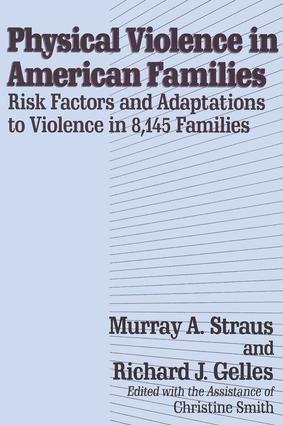 Physical Violence in American Families provides a wealth of information on gender differences and similarities in violence, and on the effects of gender roles and inequality. It is essential for anyone doing empirical research or clinical assessment. Violence and Pregnancy: Are Pregnant Women at Greater Risk of Abuse? Ordinary Violence, Child Abuse, and Wife Beating: What Do They Have in Common?